Dravet Syndrome, behavior and cognition. Dravet Syndrome, or Severe Myoclonic Epilepsy of Infancy (SMEI), is a severe childhood epilepsy due to disruptions of the SCN1A gene. Besides the actual seizures, Dravet Syndrome is characterized by a plateauing of cognitive development in the second year of life. In childhood, most patients with Dravet Syndrome have intellectual disability, and the frequency of other neurodevelopmental disorders including autism are increased. Neurodevelopmental features of Dravet Syndrome have recently come into the focus of research, as de novo mutations in SCN1A were discovered in patients with autism. Now a recent study in Nature sheds some light on the underlying pathophysiology and discovers a surprising treatment effect. Behavioral phenotypes of SCN1A +/- mice. Dravet Syndrome can be modeled in genetically altered mice, which are heterozygous (+/-) for the SCN1A gene. These mice have temperature-dependent seizures and display a number of behavioral peculiarities. In their recent publication, Han and colleagues perform a wide range of behavioural tests to characterize the deficits seen in these mice. First, The Open Field Test provides an opportunity to investigate the spontaneous behavior of mice. SCN1A +/- mice cover more distance compared to control animals, a feature reminiscent of hyperactivity. Also, in the Open Field Test, SCN1A +/- mice spend more time grooming and less frequently explore new corners of the field. The authors suggest that these phenotypes might be models of anxiety and stereotypic behavior. Secondly, SCN1A +/- mice have deficits in social interaction in a so-called Three Chamber Test, which exposes mice to other known and unknown animals and quantifies the interaction between animals. Third, SCN1A +/- mice have deficits in the context-dependent spatial memory. This type of memory is envoked when animals return to a place that is connected with an unpleasant or painful experiment. In the experimental set-up, mice were given a brief electric shock and the freezing response was measured. Freezing in mice is an anxiety reaction that can be quantified: SCN1A +/- “froze less” after 30 min and 24 hours, i.e. the memory of the initial painful situation was weaker. SCN1A in forebrain interneurons. Genes can be disrupted in particular tissues only, which gives researchers the possibility to investigate a given gene in different organ systems. The authors used the so-called cre-lox mechanism to selectively ablate SCN1A from forebrain interneurons. Animals with this focused gene disruption showed the same deficits, suggesting that the behavioral deficits are particularly due to SCN1A dysfunction in the forebrain. The authors went on to demonstrate that this dysfunction results in a reduced firing frequency in GABAergic interneurons. Clonazepam to the rescue. Benzodiazepams such as clonazepam are GABA agonists, i.e. they enhance the transmission of the GABAergic system. GABA is an inhibitory neurotransmitter, the main neurotransmitter that says “no” to neurons. The authors hypothesized that the deficit of GABAergic transmission could be modified by enhancing the GABAergic transmission in SCN1A +/- mice through benzodiazepams – and the results were impressive. Virtually all behavioral deficits in SCN1A +/- animals could be rescued through a single dose of clonazepam, suggesting that the deficit due to lack of SCN1A can be overcome by strengthening the same network. Results of one of the experimental settings used by Han et al. 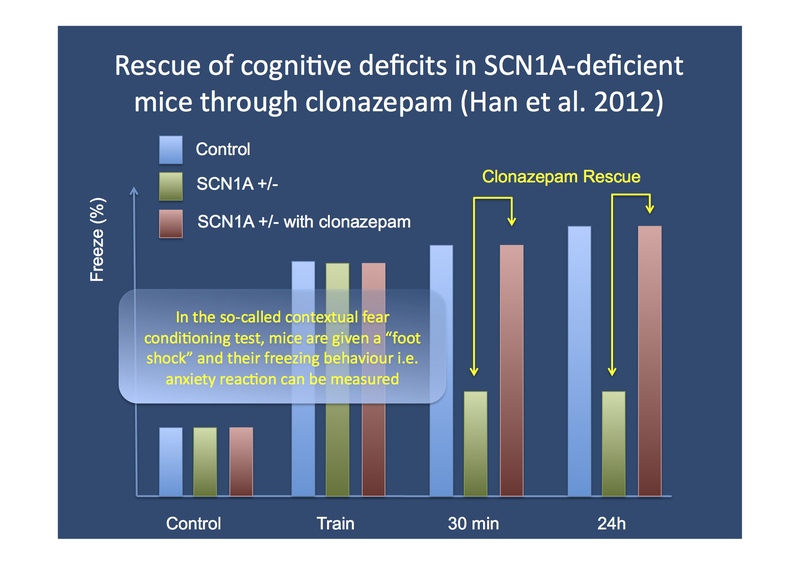 In the contextual fear paradigm, a single dose of clonazepam rescued the deficits in the SCN1A +/- mice. What does this all mean? The results of this study are impressive, but also leave many questions. The cognitive deficits in patients with Dravet Syndrome are not easily overcome through benzodiazepams, but this might not preclude the possibility that some effects on cognition can be achieved through optimal treatment. This is clearly an hypothesis that will be tested in clinical studies. Also, Han and colleagues elegantly show that the intellectual disability and behavioral problems in patients with Dravet Syndrome might not be static deficits due to cell loss or scarring, but might represent functional reorganizations of neuronal networks that can possibly be modified. This entry was posted in 2012, basic science and tagged autism, clonazepam, Dravet Syndrome, SCN1A. Bookmark the permalink.